From Mary Greer's Timeline...and to be amended with Etteilla card types as per known histories.
. 1750 Manuscript (discovered by Franco Pratesi in the late 1980s), that lists cartomantic interpretations for 35 Bolognese tarocchi cards along with a rudimentary method of laying them out. A sheet of 35 Bolognese cards (trumps and number cards) are labeled with simple divinatory meanings such as “journey,” “betrayal,” “married man,” “love.” A later deck of double-headed Bolognese cards from the 1820’s are labeled both top and bottom with divinatory meanings, showing a continuity of use. Cerulean - Fabulous - I'm so glad you are updating this material. What a wonderful resource. Pictures can be embedded directly in this forum so it would be nice to have a front and back image of all the decks. Maybe someone else can help with that as I only have the 1890? basketweave-back Etteilla and some modern Grimaud reprints. I was going to try to figure the embedding images part...it took me a few weeks to gather my reproductions, the 2006 Christie's catalogue and few authentic period Etteilla decks. It was not until recently the differences between the Lismon and circa 1900 BP Grimaud really caught my attention. I will compare the Lismon keywords with the Editions Dussere keywords with the Julia Orsini translations. The Julia Orsini booklet by Editions Duserre is straight cartomancy. I do not remember this booklet using the Grimaud booklet terms such as Hirams Key, Solomon, etc...so it lacks Bible or what Decker and Dummett call Biblical and Freemasonry terms. Small steps as questions come up. The Julia Orsini booklet by Editions Duserre is straight cartomancy. So The Mystical Origins of the Tarot maybe has the original (or nearly...) meanings. It's a great pity when the 'development' of something obscures its' origins. You'd think we would have learned that by now. I use Editions Dusserre or Papus' Divinatory Tarot. I reported Lismon Etteilla 1890 differences with Grimaud 1900 and similiarities in the Modiano 184 1948 thread and attachedfree lists of keyword meanings there from the French Ettiella decks and Papus and Modiano 184 1948. I believe those who want general summaries will find my suggestions very narrow, as my comparisons lately are historical within limited means. No, I do not use Husan for Eudes Picard or Etteilla. The links or attachments in my Modiano 184 1948 thread gives more direct comparisons or information if you care to be befuddled in these fussy bits! The listing of Etteilla cards in #1 does not include 78/0 Madness/Folly... ? Do you mean the copied excerpt in post number one from Mary Greer's Timeline that she lists as Jeu/Fool as 0? I haven't changed her text. I am sorry if I haven't made clear which excerpt from her timeline leads into my notes, if you are asking what her text means. Please let me know. Or do you mean you want to know what I now find attributed to Card Zero or #1 in my Etteilla Lismon 1890 or Etteilla Grimaud 1900 or the Editions Dusserre booklet? I will look that up for you if you are asking me to check my decks/booklet. Card 77 is Perfect Contentment, Ace of Disks. Card One is Consultant. Card 21 is African Despot with Dissension upright, Arrogance reversed. Are you asking me if there is a Madman in the Etteilla tarots? I looked quickly and did not see it in the 1890/1900 Etteilla tarots. If I find one in the Editions Dusserre booklet, I will let you know. 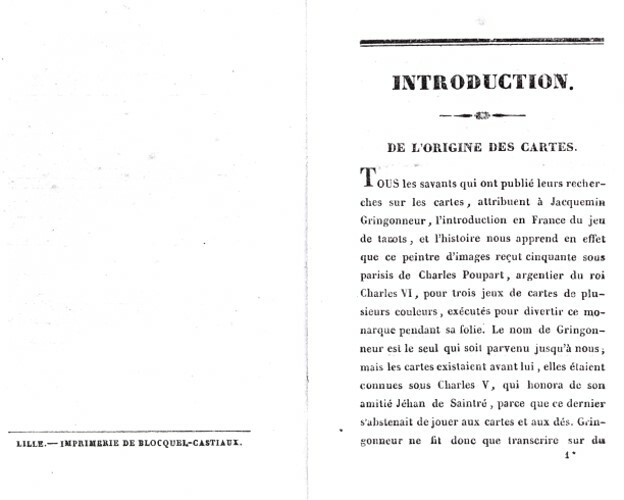 In Card 78 of the 1890 Lismon Etteilla, there is "Folie of the Alchemist" and in the Grimaud 1900 Etteilla the "Folie" is upright and reversed with what looks to be a small circle on both ends upright and reversed--so at the ends, you could think this was a zero. This is a begger hunched over with a mountain top in the distance that he is facing and the spotted cat is munching on the back of his knee. I have been looking at so many sources for my Etteilla/Modiano 184/Papus Divinatory Tarot comparisons, I am sorry that I am wondering what number one you are asking me to check out...you asked a simple question, I know, but I am comparing different Italian/French decks and books these days. 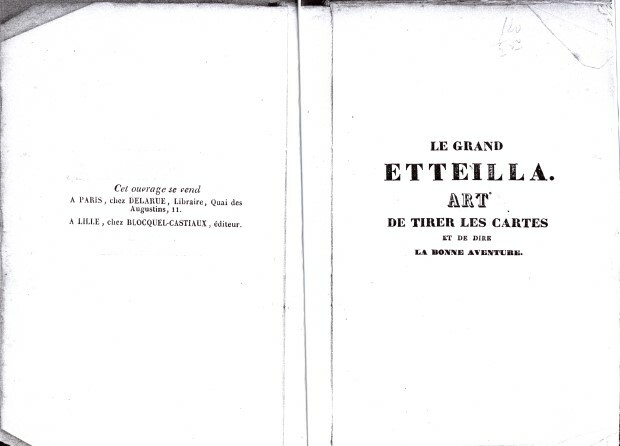 I have been unable to find any justification for Greer's entry for 1800, asserting the existence at that time of the book ascribed to Julia Orsini called Le Grand Etteilla. Her dating of that book contradicts Decker Depaulis and Dummett, and I can find nothing to support her. They say that this book was published "in 1838, or a trifle earlier" (Wicked Pack of Cards p. 147) with no mention of an earlier edition. They specifically say that the cards reproduced in that book were the invention of the 1838 publisher. They might be wrong, too; they give no justification for their dating either. My guess is that Greer misread an entry for the book in WorldCat. One of the dated entries there for Orsini's book says "1800s"--in other words, sometime in the 19th century. Other WorldCat entries give 1850 as date of publication for one and later dates for others. The entry for "1800s" gives two libraries with the book: the Wellcome Institute and the University of Nevada at Las Vegas. The catalog of the U of N at LV (http://webpac.nevada.edu/search/X?SE...=5&submit.y=11) has under "publication data" the entry "Paris: Marchands de Nouveautés, [18--?]" and says that the book has 212 pages. The Wellcome Institute (http://catalogue.wellcome.ac.uk/sear...&submit=Submit) says "[Paris? : s.n., ca. 1850]" and that the book has 78 pages. These are for the same entry in WorldCat! From the number of pages, one would think they were different publications. The 212 pages do not even include the reproductions of the cards, which add 78 more pages. The University of Nevada at Las Vegas also owns another edition of the book with the data “Paris: [s.n., ca. 1850]”, according to its catalogue (http://webpac.nevada.edu/search/X?SE...=5&submit.y=11). I made a point of including Las Vegas in a recent vacation, so I could see what the University of Nevada at Las Vegas actually had, focusing on the one for "18--?". I didn't pay much attention to the one they had for ca. 1850, except to notice that the binding was much better and the size of the pages and typeface much smaller than the other. The one they had for "18--?" has no date in the book itself, as expected. The publication data that it does have lists Paris and Lille as the places of publication in one entry and just Lille in another. The editor (or is it the publisher?) is given Blocquel-Castiaux. It does indeed have 212 pages. Here are scans of relevant pages. For the left side of the first scan, there is a blank page on the right in the original. For the right side of that scan, the second page with printing in the book, there is a blank page on the left in the original. These publication data correspond closely to that indicated by Decker et al, except, of course for the part about "1838, or a trifle earlier." Decker et al (p. 147) indicate Blocquel as the publisher and Lille as the place. “Lismon” is one of Blocquel’s pseudonyms, according to Decker et al. It has been speculated that “Julia Orsini” is another pseudonym, but Decker et al think that the evidence suggests otherwise. Castiaux is Blocquel's father-in-law, according to Decker et al. Can we say more about the publication date of the U of N’s book, since Decker et al give no rationale for their dating? At the back of the book is a list of recommended books, scanned below. I looked them up in WorldCat. 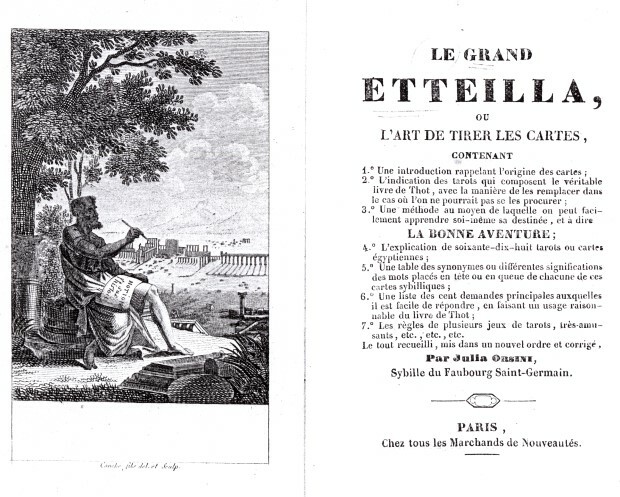 The first one, Le Tresor du Vieillard des Pyramides, is in the Bibliotheque Nationale, with publisher Bloquel at Lille, but undated. However a reprint that is part of an anthology published in Montreal 1969 gives “1839 ou c1840” as the date of this edition (http://catalogue.bnquebec.ca:4400/cg...&sy=&ey=&scr=1). 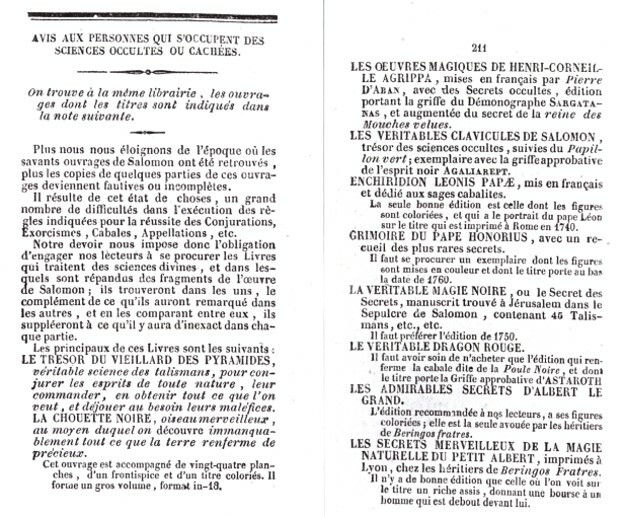 I also looked up the other books on the list; three were in editions by the same publisher, Bloquel at Lille: the Oeuvres Magiques de Corneille Agrippa, “1830”; the Enchiridion Leonis Papae, “1819”; and the Grimoire de Pape Honorius “1820?,” per WorldCat’s information. They are all reprints of earlier works. The others had different publishers, 18th century. 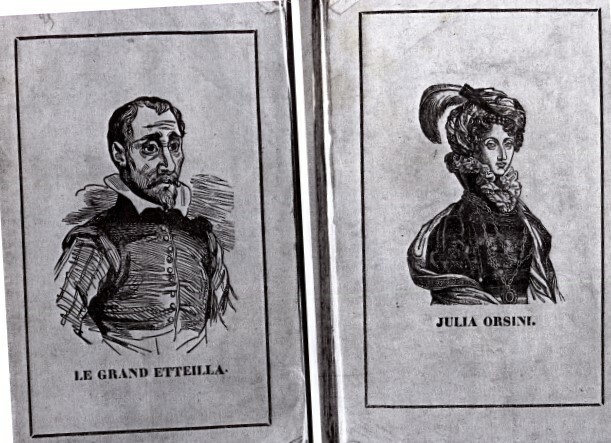 Without other information, we would have to say that the U of N's copy of Julia Orsini's book was probably published in 1839 or a trifle later. Since the editor gives no indication of an earlier edition (as he might have, to show its closeness in time to that of Etteilla), this date would appear to be the earliest known for the book in any edition. I have no idea which copies Decker et al consulted,. It might pay to consult the copy of the book in Lyon, whih also has 212 pp., or one of the modern French editions, but I am nowhere near the libraries that have them. These modern editions might have better information on the original date of the text than what I have found, information that the library catalog entry writers missed. But unless there is such information, it seems unlikely that the book was first published anywhere near 1800. I really appreciate all this information. I don't remember where I got the 1800 date - but that's what the "c" is about. It stands for "circa" 1800. It seems that most people now give a date of 1838 as you said. Again - thanks for all of the above.